Completely put away all tools/fabric/patterns from step to step. After I draft a pattern, everything gets put back before I begin cutting out the pattern and so on. Following the completion of each project, vacuum and dust. This mentally frees me up to say goodbye to one project and hello to a new one. A place for everything and everything in its place. This mostly applies to all my sewing notions, trims, buttons, threads, etc. Number three, in particular, took me quite a while to finagle and organize into my sewing pleasure. So I thought I would share a few pictures highlighting how and in what, I organize my notions. 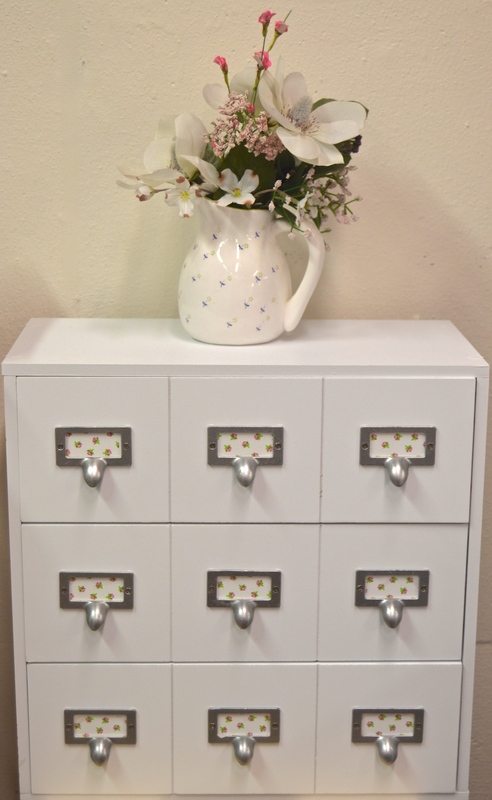 A few years back, I purchase a rolling cart with many shallow drawers from Joann Fabrics. I placed the cart right next to my sewing table so everything I need is in easy reach. 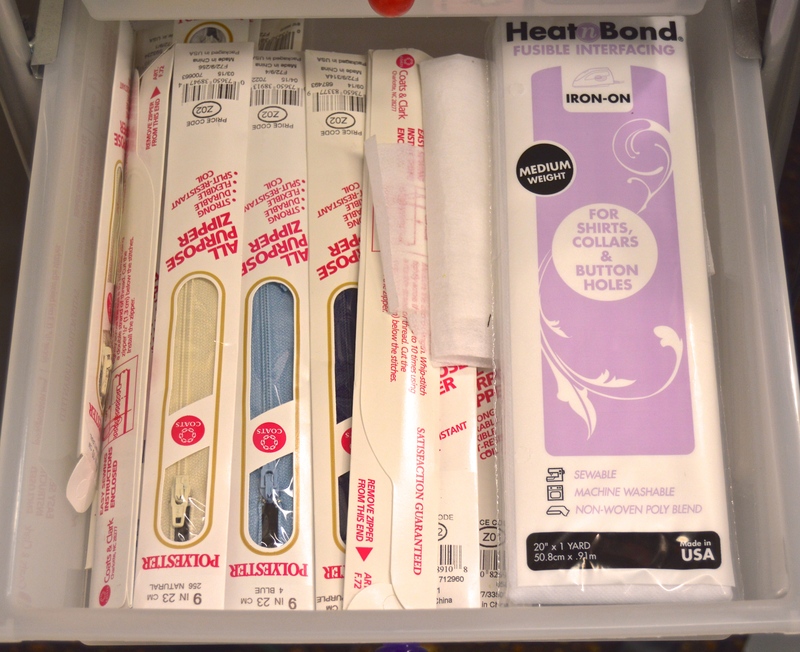 The shelves have proven to be perfect for thread, snaps, needles, zippers, etc…. I have two drawers that hold my threads which I color code. I then make sure that the bobbins stay with the thread it matches. I also picked up this little organizer from Michaels last November. 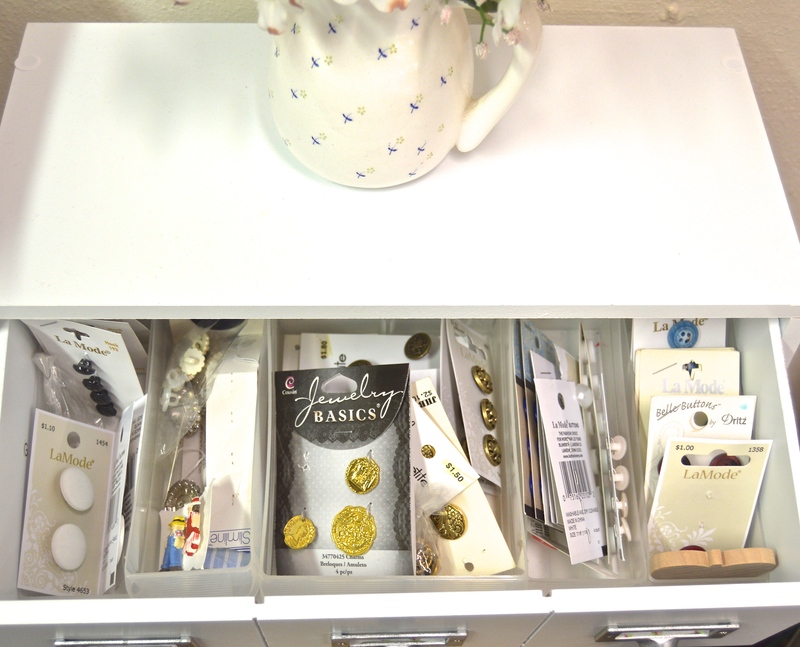 It is perfect for holding all my buttons which I organize by color, stapling multiples together. 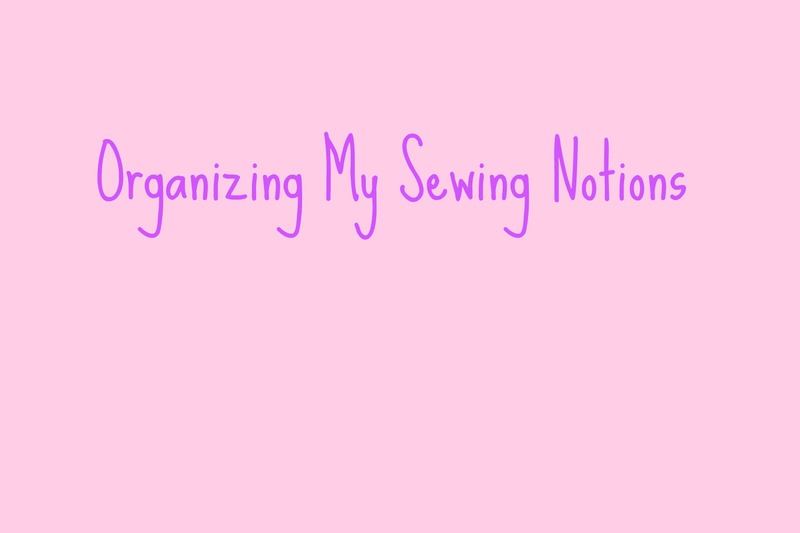 Find the best way to organize your sewing surroundings and watch the creativity flow! 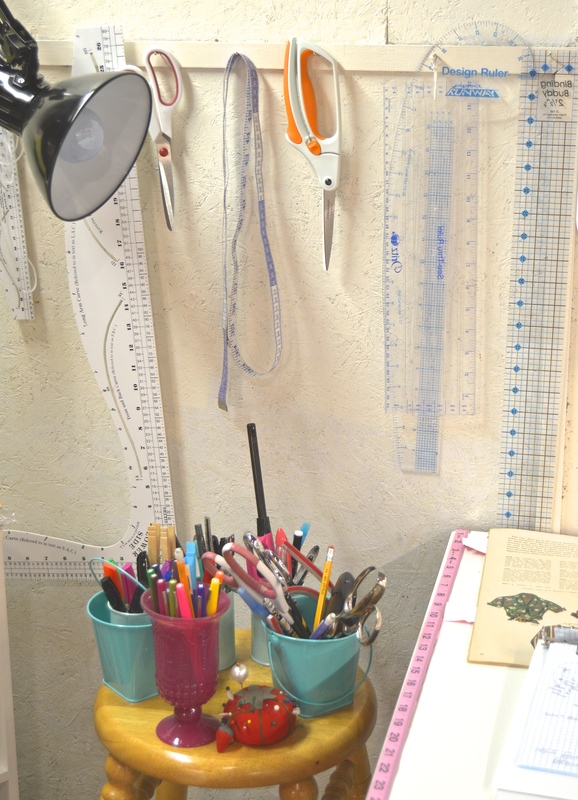 My studio does double duty as my teaching studio for both music and sewing. Add in the ZERO closets in my apartment and overall tinyness (husband + me + dog + cat in 350 square feet), and I’ve had to do some large but ugly storage solutions. All of my sewing notions (and I have a lot — friends keep donating “granny’s old things” etc) are kept in 4 boxes stacked on top of each other next to my table. 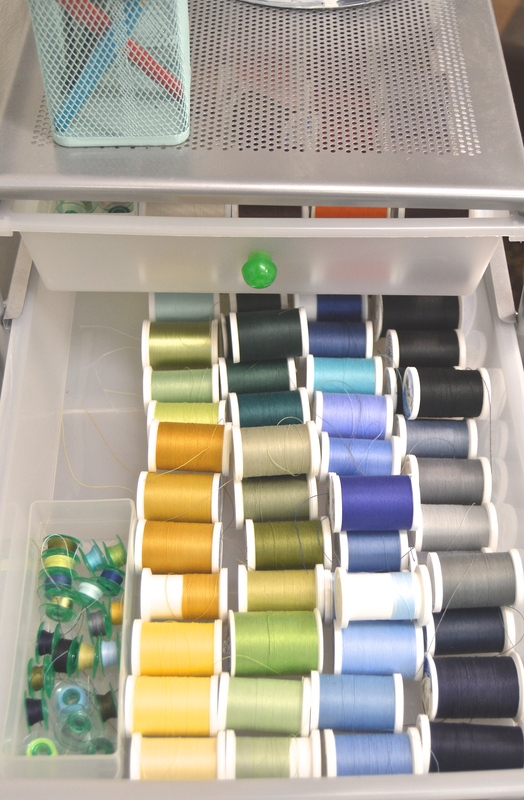 The bottom paper ream box is full of thread, which I keep in ziplock baggies according to color. The second box (tomato box) up is notions, which is an unholy mess to dig through but there is SO MUCH that I fear any organizing would take up precious space. The next box (case of beer) is ornament — ribbon and trim. Most of these are individually ziplock bagged so they don’t become a mess. The top box is a flat box open along the top. I have put an additional box INSIDE that one, which is a several quart food box with handles that I have all of my bias tape color coded. Alongside the inner box I have all of my newspaper for easy access in pattern drafting. And usually my see-through drafting ruler sticks up out of the newspaper for easy finding. I think yours is the first notions storage I’ve seen that comes close to the amount that I have but in a much more attractive way. I really like the way zippers are so easy to see and work with. Oh my goodness! That is a lot in a small space! 😊 I like the idea your unique storage containers. I’m impressed that you sew and are musical! Wow! Thank you for your comment and I hope you have a great day! 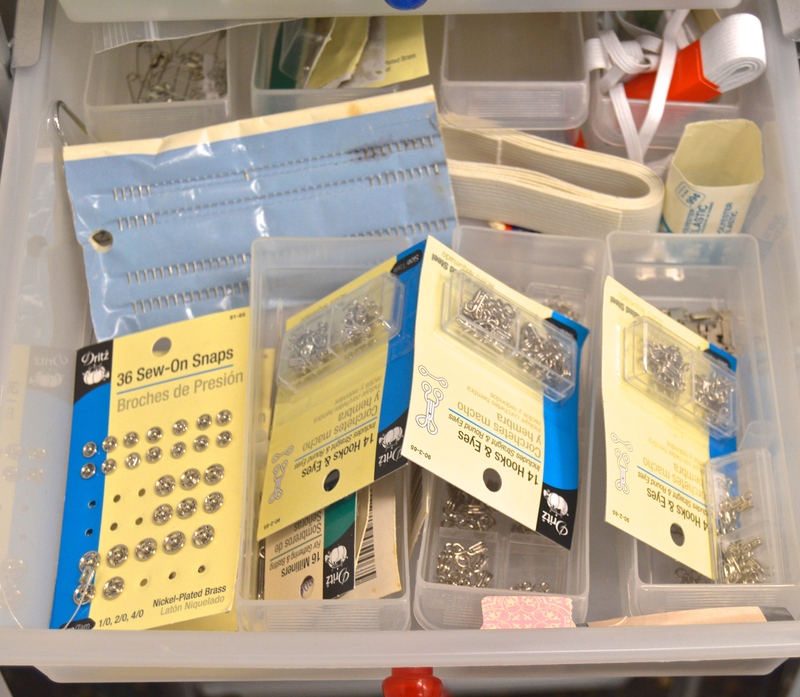 Being organized while sewing makes all the difference. knowing where everything is and being able to access it when you need it can make the whole project run smoother. I love how you’ve organized your notations for easy access. Nice job. Thank you so much! It truly does make a difference and eliminates buying extra notions when I know exactly what I do and don’t have.